Factory original replacement tail light assembly. Choose side. Choose used in very good condition factory trim parts - painted or unpainted. 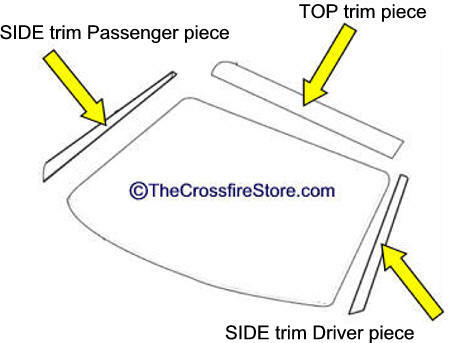 Top trim parts numbered varied: 5PC62P41AA, 5PC62XZAAA or 5PC64XZAAA. Chrysler changed the part numbers on these parts several times. Do not be concerned if your part number does not match these listed numbers. There are too many to list. 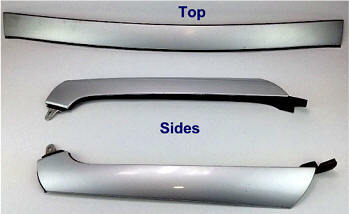 You simply have a choice of Top Trim Piece, Right side or Left side Trim pieces. These are used parts in good condition taken off or Crossfire accident cars. They may have some light scuffs or light fade. Once they are painted they look new. These parts are brand new reproduction parts produced exclusively for TheCrossfireStore and once installed they look just like the factory original. They mount the same way with the same clips. These are freshly painted Crossfire Silver. These parts are made in Florida, USA. These parts are the factory original from Chrysler. The only difference from Reproduction parts is these are more expensive.